Christine received a grant of 200,000 Tz shillings (around £80) in May 2016. She has recently requested a loan to expand her business. It’s already half the way through the morning when we meet Christine on the side of the road. She has been hard at work since the early morning checking on her rice and weeding out the unwanted grasses. The water levels have dropped these past weeks but she is able to irrigate her crop by opening up channels from the nearby river. Her rice is growing well : she planted the blocks in January and it will be ready for harvest by May. Already some of the rice is beginning to flower and once the seeds have formed she will have to employ two young men to scare the birds from the crop. 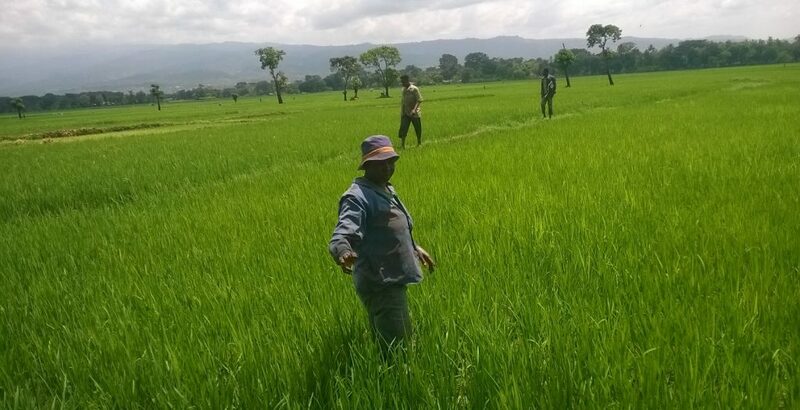 This is Christine’s second rice crop since receiving her grant from Mondo last May. Before receiving the grant she only grew rice in a small family garden but the grant has enabled her to rent 6 further plots and to improve the quality of her rice with fertilizers. Christine could not manage without the help of her eldest daughter, who either helps her at home or comes to work in the fields. Her two sons are still in school, secondary and primary. Two of her children are also HIV positive. She was unaware of this until one of the younger children became seriously ill with a stomach complaint that required surgery and from which recovery was very slow. When Christine’s eldest daughter is not helping Christine in the fields, she is helping at home with Christine’s sister whose mental illness and loss of memory seemed to start when she began taking ARVs, as she also is living with HIV. Christine has a busy life leaving her house, which was left to her when her husband died, early in the morning and walking the 2kms to her plot. Christine has worked very hard to build up her business and hopes to expand further in the future with a low interest loan from Mondo. If you would like to help support more women like Christine, we are currently raising funds for our next round of grants and loans. To help us achieve our target you can donate here.